I apologise for the slim offerings to be found here on my blog so far this year. By way of explanation (particularly for my regular readers!) I have had a touch of writers block due to an identity crisis regarding the overall purpose of my blog. To my mind, my blogging seems to have drifted a little away from archaeology and more into technology and gadgets which is not at all where I want to to take it. While relevant, I want to make that type of content more of an aside to posts that are principally about archaeology: it is after all supposed to be an archaeology blog. So in this post I thought I should get the ball rolling again, so to speak, by writing about a research project I am working on at Weipa in northern Australia. It will be split up over a few separate posts, with what follows simply serving as something of an introduction to the issues were are exploring. Way back in 2005 I was in a meeting with a number of Elders from the Aboriginal community of Napranum (near Weipa). At that stage I was managing an Indigenous land and sea management program, so my role was to liaise with people about land management issues – which almost always came back to heritage management – and obtaining funding to do management oriented projects. Although we were supposed to be discussing weed management issues (a particularly exciting topic I might add), the conversation quickly drifted onto more interesting issues. The Old Ladies I was meeting with had all grown up in the mission dormitories which, by all accounts, appears to have been a traumatising experience for many. Removed from their families at a very young age they were essentially locked in dormitories at night and were only able to see family on a fairly infrequent basis. Often their only substantive interaction with older kin was during camping trips out bush away from the mission. Along with the need to regularly attend church and school, they were also expected to work which the Presbyterian Mission superintendent considered to be a form of preparation for the practicalities of their adult lives. This meant domestic chores for girls and young women, and gardening and manual tasks for the boys and young men. The quote was quite significant at the time because from earlier work in the area I was well aware of a widely held view at Weipa that bush foods (i.e. bush ‘tucker’) are considered more healthy than store bought foods. This is because many people associate getting bush foods and being on Country with a sense of health and wellbeing. Simply put, being on Country and eating bush food is good for you in all respects: socially, emotionally, physically, spiritually. In my view, the statement was important because it indicated that the Elders saw a link between history, learning about history, wellbeing and health. Looking at it now, I’m not so sure that this quote best demonstrates this point, but it was certainly the idea that I went away with that day. The other idea that those Old Ladies shared with me was that despite all of their bad experiences, people remember the ‘mission days’ as a period of comparative health and happiness compared with today. In short, ‘they were healthier times’ in the sense that health meant more than just physical health as such. After that meeting it took a further few months of discussions with Elders to develop a research project. We entitled it ‘they were healthier times: indigenous health and wellbeing within the Weipa Presbyterian Mission’. The broader project idea was to look at the history of Indigenous health and wellbeing (defined broadly as emotional, physical, social and spiritual health, after Anderson 1996) from an historical perspective. Simply put, our core question was: what was the nature of Indigenous wellbeing throughout the history of missions in the area and how is this relevent to the community today? The project also explores an important view held by community Elders: that younger people in the community do not ‘know’ the real history of their community, and that learning about this would in fact contribute to improving their wellbeing. This is because they associate a knowledge of history, culture and Country with improved health and wellbeing. Our evolving project involves recording of oral history, Traditional Knowledge, archaeological surveys around key mission settlements and also work on historical documents. We obtained initial funding from the Australian Institute of Aboriginal and Torres Strait Islander Studies (AIATSIS) in 2007 and from the Federal Government’s Indigenous Heritage Program (IHP) in 2008 and began work on the project in early 2008. Since my original conversations with Elders and anthropologist Darlene McNaughton, several other people have become involved in the project including fellow archaeologist Justin Shiner and more recently historian Geoff Wharton. Our results are preliminary at this stage, with our first concerted period of fieldwork mid 2008. 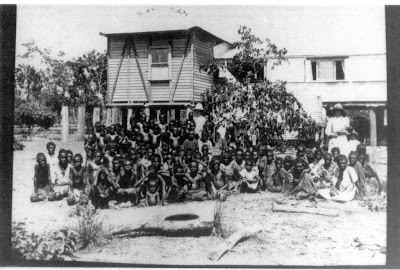 In the next post I shall write about the original Weipa Mission site which operated from 1898-1932 and the results of archaeological and oral historical work we completed there last year. The photograph below was take in the early 1900s at this site. Anderson, I. 1996. Aboriginal well-being. In C. Grbich (Ed. ), Health in Australia: sociological concepts and issues (pp. 57-78). Sydney: Prentice Hall. A calligraphy pen on an Aboriginal mission site?